I should have taken a picture before my Mom and I tore into it! 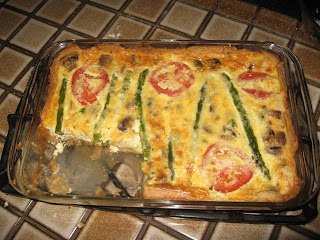 Kathy Good Taste decided to whip up a Quiche on Sunday morning and I happily indulged. 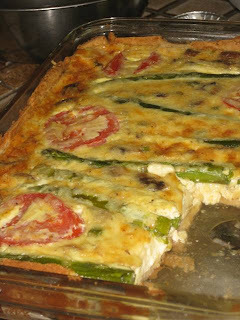 Her flaky pie crust is what really made this quiche special, no one has it beat. Eggs, cream, sugar, salt & pepper, Tabasco, ham, mushrooms, cheddar cheese, green onion, asparagus and tomato finished off the dish! How beautiful is it? I mean really. I hope every one's weekend was as relaxing as mine! How is your Monday treating you so far? I am not much of a eater when I first wake up in the morning. It takes me a few hours and a couple cups of coffee for me to really want to eat something. I know that this is not good, in fact a terrible way to fuel your day. 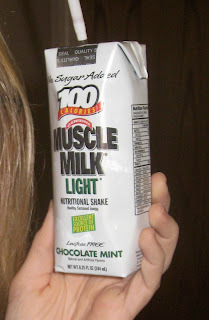 So I turned to my little friend, Muscle Milk Light to help me start my day off better. No sugar added, 100 calories, 3 grams of fat and 15 grams of protein later I feel a little more prepared to tackle my day. I chose the Chocolate Mint flavor, and it is just divine. I highly recommend this shake for sustained energy throughout your day! 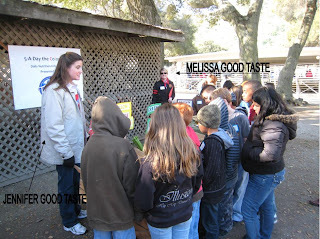 San Benito County Farm Day is put on for local 3rd graders to learn about agriculture in the County. 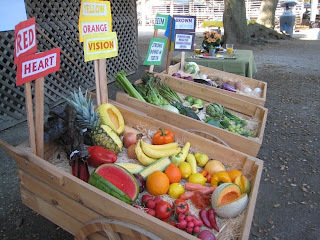 5-A-Day the Color Way was a Nutrition Information presented by Tanimura & Antle's Jennifer Dassel. 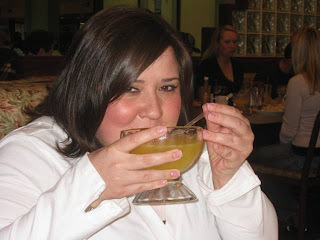 (Who is a guest blogger here at Melissa Good Taste). 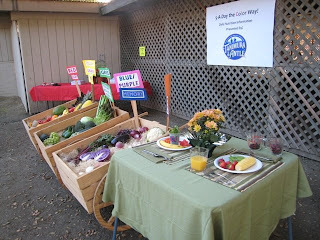 Yum, tasty fruits and veggies! 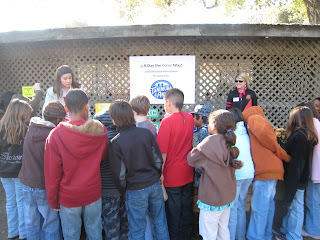 I was a classroom guide and had a fantastic time leading the kids around through the many demonstrations. From livestock, tractors, a veterinarian, a farrier to even a bee keeper! There was a lot to see and do. What a day! Congratulations to the committee and Farm Bureau for a great event. I am sure the 3rd graders will remember it forever. Okay you may be thinking, "All this chick eats are Crab Cakes!" True, true. It is! 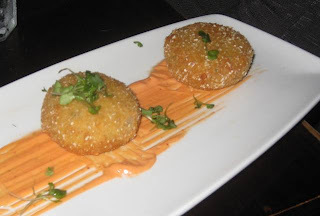 But, I am happy to report CAFE ELLA in Hollister are now serving the best Crab Cakes ever. Why you ask? Because they are bathed in a lovely Dijon mustard sauce, along side shaved apples and asparagus! Love, love it! I wish I took a picture but I didn't, bad blogger. Enjoy! Say Melissa Good Taste sent you! 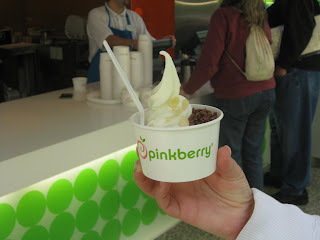 Before we hit the road on Sunday afternoon we decided to check out Pinkberry and see what the big hype is about ... Hollywood loves this stuff! 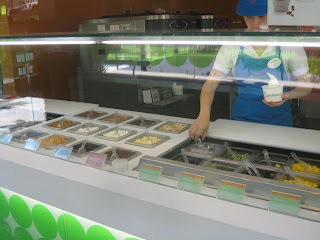 I decided on the Original yogurt with my two sides: Shaved milk chocolate and almonds. I enjoyed it, but am not sure why people are obsessed with this stuff. 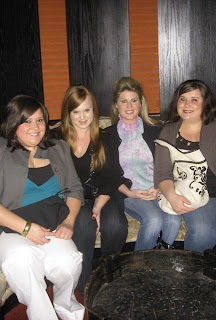 Us all rested up and relaxed from the day at the Spa. Now time to make our 9pm reservation at Sino's - just a 5 minute walk from the Hotel Valencia. 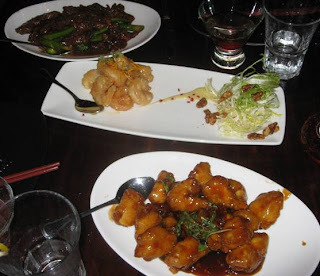 Sino is a modern Chinese Restaurant - Cantonese flair and fusion. Sino had a wonderful drink menu. 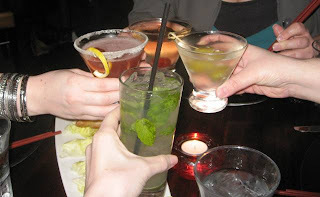 Starting clockwise: Elena ordered the Ecstasy - Absolut Peach Vodka, Peach Liqueur and sparkling wine. Amanda ordered the Dirty Dirty Martini - Kettle One Vodka, olive juice and hand stuffed blue cheese olives. I ordered my usual Mojito - this one made with Tangueray Rangspur Gin, fresh lime juice and mint leaves. Last but not least, Kelly ordered the Red Head in Bed - Strawberry Smirnoff, muddled strawberries, lemon sour, simple syrup and Sprite. 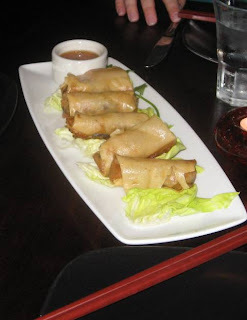 These are Vegetable Egg rolls, we did not order these but they placed them on our table. They said it was their mistake but allowed us to enjoy them anyway. They were great! My favorite of the night! 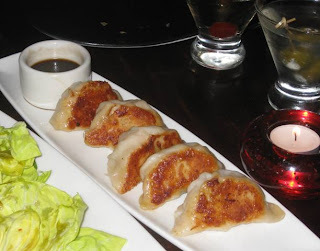 These are the Maine Lobster & Prawn Pot stickers with Black Vinegar Dipping Sauce. I wanted these to be delicious, I really did. I was not impressed. The dipping sauce was very good though. I thought the Hot & Sour Soup would just be out of this world from the description on the menu. It included crab, sea scallops and shrimp. 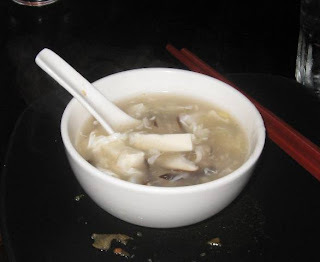 Unfortunately it was officially the worst Hot & Sour Soup I have ever had. It tasted like cornstarch and white pepper. Yuck. Crab cakes! These always make me happy. Taro crusted in spicy Chili Citrus Aioli. I don't feel the sauce contributed anything to the cakes. They were better on their own. Sorry for the poor photo! The first up top is the Wok Fired Steak, I did not try this but Kelly said it was too chewy. The middle dish was the 3 girls favorite of the night, the Orange Roasted Prawns with candied walnuts. Yum! And last but not least the Kumquat Chicken. I had a few bites of this and enjoyed it. Very sweet! 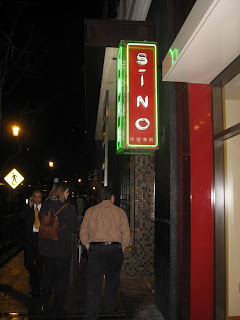 All in all our experience at Sino's was a good one. The inside was packed and they have very LOUD music pumping in the bar area. We sat in the very back of the restaurant and still were having trouble holding a conversation amongst the noise. The restaurant turns into a nightclub and as we were leaving there was a line about 30 people deep to get in! The food was hit and miss, pricey but it was a cool space. I now know what to order and what to stay away from. The service was decent for it being so packed. I would return. 1.75 thumbs up for awesome atmosphere. 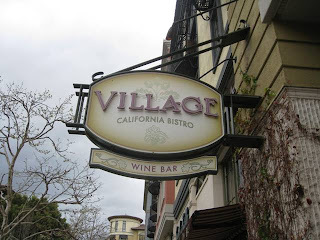 Our first meal of the Girl Spa Getaway on Santana Row was at The Village Bistro and Wine Bar. We were attracted to the California inspired cuisine focusing artisan quality seasonal ingredients right here in our own backyard. The menu emphasized freshness, quality of ingredients and classic cooking techniques. We were sold! 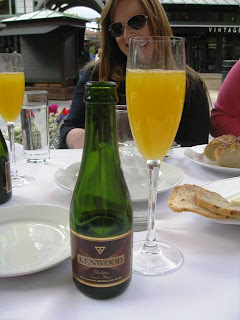 It was past noon when we arrived but Mimosas still sounded delicious. They did not fail! My order was the Chardonnay Steamed Mussels. 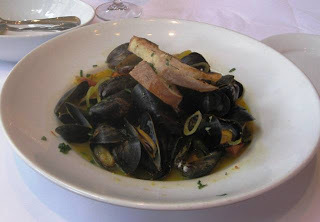 Prince Edward Island Mussels, Andouille Sausage, Saffron, Spicy Aioli, Garlic Toast. Very good! 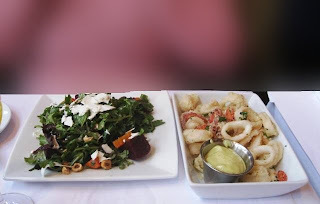 Elena's order: Heirloom Beet Salad with Wild Rocket Arugula, Toasted Hazelnuts, Ricotta Salata Cheese, Citrus Vinaigrette and a side of Crispy Monterey Calamari. She raved that the calamari was the best ever. 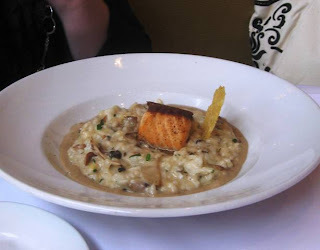 Kelly's order: Wild Mushroom Risotto in Porcini Cream Sauce with an addition of Grilled Salmon. So comforting. Ample portion size as well. Amanda's order: Egg Bruschetta . 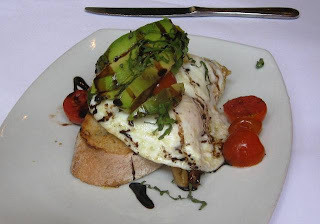 2 Fried Eggs on Grilled Artisan Bread, Crispy Bacon, Balsamic Tomato Relish & Sliced Avocado. She loved this dish however, a too healthy of a schmear of mustard threw off the taste she was hoping for. All in all we had a lovely time at this little bistro. We started off outside on the sidewalk sitting at quaint table. The weather started to get nasty and so half way through we moved inside. 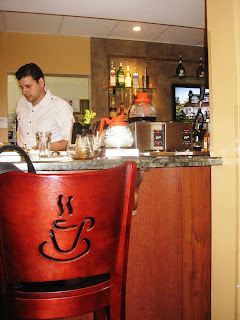 The staff was very accommodating and very sincere. 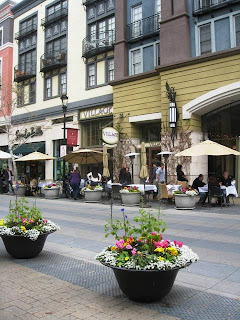 The meal was a smidge pricey but what do you expect on Santana Row. Would I return? Maybe. I want to check out all the rest of the restaurants on the Row first though. 1.5 thumbs up. 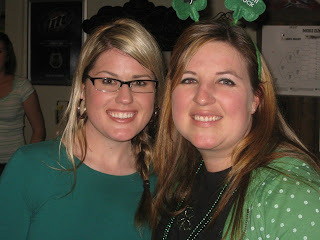 So my girlfriends decided to get together for a total GIRL weekend. 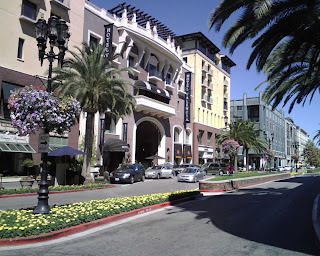 We met up at the Hotel Valencia on Santana Row in San Jose. 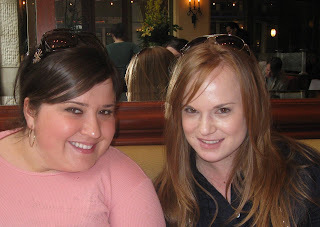 We planned on having a leisurely lunch on Saturday at a restaurant on the Row. 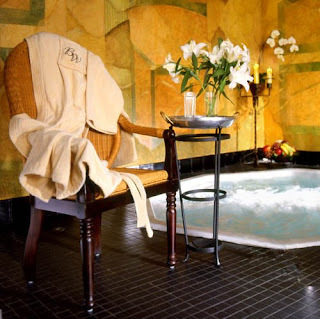 After lunch, heading over to the Burke Williams Spa to get facials, massages and bath treatments. 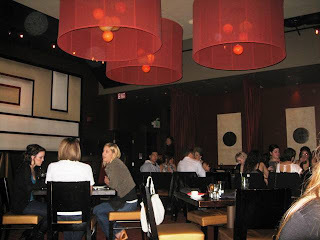 After all that relaxation, we were then to enjoy a fabulous dinner at Sino, a happening restaurant also on Santana Row. After dinner, float on into the V Bar and enjoy a final beverage before retreating to our fabulous room and catching some Z's. Wake up Sunday morning and indulge in Hotel Valencia's complimentary breakfast at Citrus. WOW! Sound fantastic or what? Wednesday evening my friends needed my SUV's assistance. They bought a new table and chairs so off we went to San Jose to pick it up. Once loaded down we wondered, where to eat? We were close to downtown so we wandered that direction. 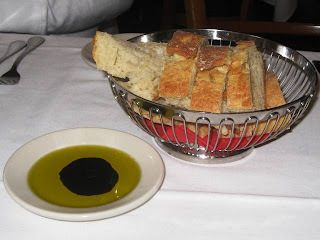 We came up to the Sainte Claire Hotel and Elena thought that Il Fornaio would be a good choice. We handed the car off to valet and in we went. We were immediately seated at a table by the window. It was a good spot for people watching. I am just going to throw out there that there are some strange people who walk along those sidewalks. Could it be the path to the train? Interesting to say the least. The waiter came up to our table and asked if we would like any cocktails or wine. We politely answered, "No, thank you." His attitude then took a 180. He seemed a little angry that we did not want any alcohol. Has anyone ever had this experience? Strike one. The waiter came back with our unleaded drinks and took our order by grunting, "You ready?" 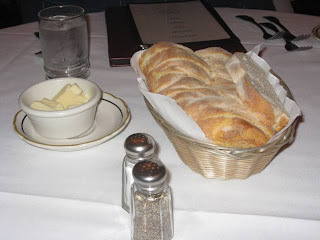 The waiter never came back until our food was ready, however - I did see him in the corner, hiding behind a pillar eating pieces of bread staring at everyone. That was way weird. Strike two. Our food finally came after tables who arrived after us got their food. Strike three? 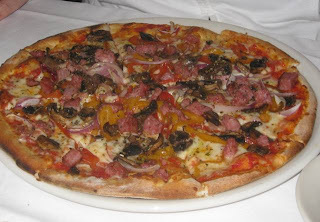 Onward... Amanda ordered the Pizza Fradiavola - Mozzerella, tomato sauce, Italian sausage, mushrooms, bell peppers, red onions, and spicy pepperoncio oil. She really liked it! Elena had a slice, and agreed it was really good. 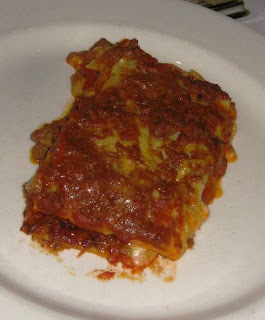 Elena's order was the Lasagna Ferrarese - Pasta sheets layered with meat ragu, porcini mushrooms, parmesan and bechamnel, then baked. When asked if she liked what she ordered she responded, "It could have been Stouffer's and I would have had no idea." Enough said. 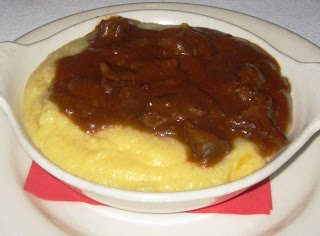 My order was the Polenta Con Goulash. Off the menu it read: "Braised beef with onions, herbs and spices served over soft polenta." What it should have actually said: "Alpo from the can, with no onions, herbs or spices served over bland polenta." Yes, I know that sounds quite harsh but I thought no effort went into the dish. In fact it was kind of insulting, put some pizazz in the dishes you send out! 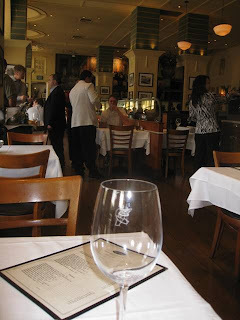 All in all, the Il Fornaio San Jose is a beautiful restaurant. The restaurant features an exhibition cooking line, two private dining rooms for small groups, 220 seats in the Main Dining room and an outdoor courtyard for cocktails and appetizers. 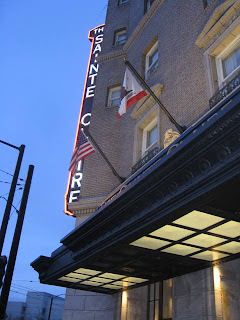 The Hotel Sainte Claire is a National Landmark and I feel the restaurant is not doing them justice. On this evening the food was not THAT bad. I mean I have had worse, but the reason I am so upset about this experience is because of the service. 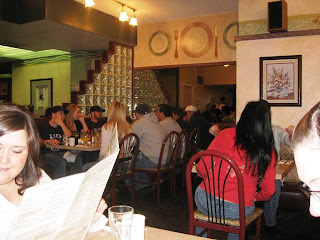 A restaurant can salvage their reputation if the food was not great, by having just really outstanding service. One thumb up for the good company and amazing dining area. 'Cloudy with a Chance of Meatballs' MOVIE! The trailer to the 'Cloudy with a Chance of Meatballs' Movie due out Fall of 2009! I am so excited. If you have children, nieces, nephews, friends who have kids or a kid at heart you will love the book. I am sure the movie will be out of this world. 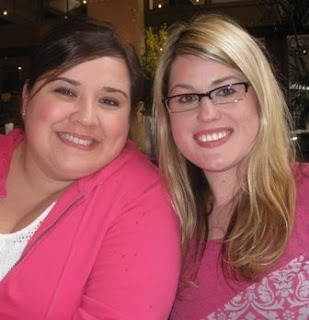 I was invited to join my two friends, Elena and Amanda to go to San Jose for a day of shopping. Before we set out scouring stores we needed to fuel up and get our energy. 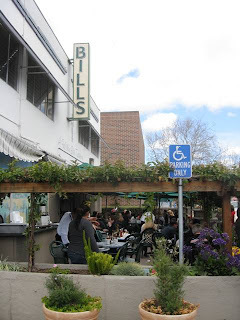 On the drive up to San Jose we were deciding on where to go and Elena just raved about "Bill's" so we made plans to meet their cousin and dine there. We pulled in to the 1115 Willow Street location and noticed the place is packed! I mean people outside, inside so full! We put our name down on the list and within 30 minutes we were seated. It was chilly outside Sunday morning so we were pretty thrilled when the hostess brought us inside to eat. Within 5 minutes of being seated we were greeted by a friendly waiter and menus so large it was going to take a Mimosa to figure out what I wanted to order. The extensive breakfast menu covers all of the classic breakfast traditions, along with an selection of creative specialties. And if you start the day late, you can rest assured knowing that breakfast at Bill's is served all day, along with a wide choice of lunch items, ranging from classic sandwiches, to salads, to our daily chef's specials. 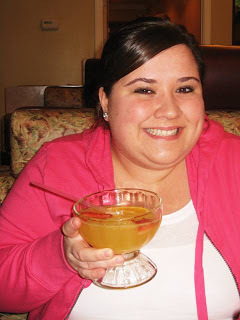 Bill's Famous Mimosa's - Champagne, fresh squeezed Orange Juice, Strawberries served in a giant "bowl." How great do those look? Yummy. 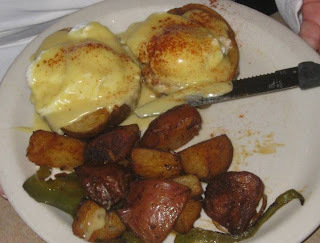 Elena ordered the Poached y Papas - seasoned Potato Skins, topped with shredded Cheddar Cheese, Bacon Bits and Chives, two poached Eggs, covered in our incredible Hollandaise Sauce. Her choice of side were the Home Potatoes. She enjoyed this. 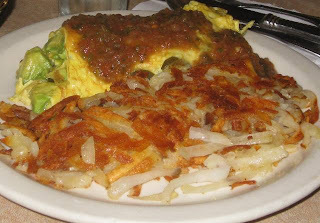 Celina ordered the Mexicano Omelette - Filled with Jalapeno Chilies, Avocado, Sour Cream, Jack Cheese, topped with fresh Salsa. Also served with Side of Toast. MY ORDER! You all are probably thinking, surprise surprise. But how could I not order the Crab Cakes Benedict? 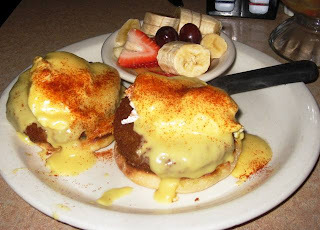 Two Crab Cakes topped with two poached Eggs and a rich Hollandaise Sauce. I elected to not have a side of hash browns or home potatoes and got fresh fruit instead. This was by far the best breakfast I have ever had. 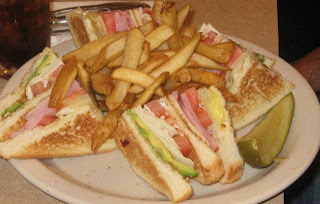 Celina's boyfriend ordered The Club - Triple-Decker! Toasted Sourdough Bread bursting with Turkey, Bacon, American Cheese, Tomatoes, Lettuce and Mayonnaise. A lot of food. Consider yourself warned. 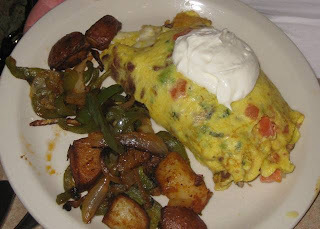 Amanda ordered The Californian Omelette -Avocado, Mushrooms, Green Onions, Tomatoes, Garlic & Sour Cream, Filled and topped with Swiss, Jack and Cheddar Cheese with an addition of bacon. She thought it was good but had a little bit too much sour cream on top. 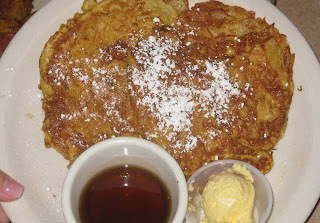 And last but not least we all shared the Parisienne French Toast -Giant Croissant baked fresh daily in our own oven, dipped in Egg Batter and grilled just right, sprinkled with Powdered Sugar and Cinnamon. How good does that sound? Holy calories it was delicious!! Wow! I was very impressed with this place. The numbers don't lie. 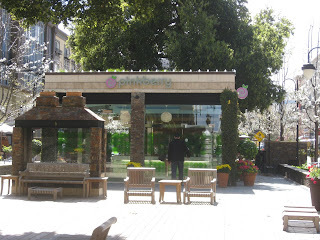 People were waiting outside for up to 45 minutes to eat here! It is that good. What I thought was nice was they offered you complimentary coffee while you waited. I also noticed you can bring your dog with you if you sat outside. That is kind of cool. They have a full bar inside the restaurant as well so you could get your drink on early, if that was your thing. I am sure everything on the menu is delicious so check it out and tell me what your favorite item to order is! Two thumbs up, hands down. This is where you need to go for GREAT breakfast. 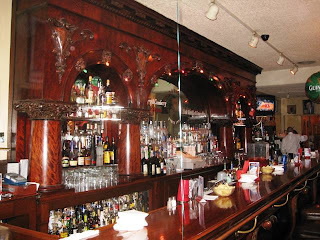 Old time Bar - very beautiful. 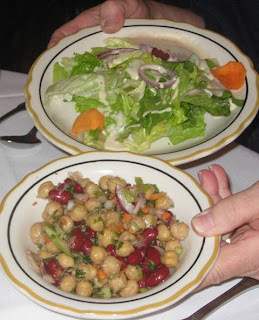 First up was the Salad with Italian Dressing and a side of Three Bean. Tasty. 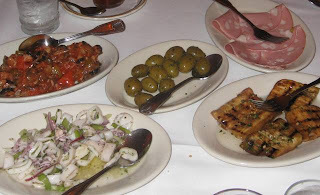 Small plates of Olives, Calamari Salad, Marinated Eggplant, Italian Ham and a pickled Vegetable Salad of sort. 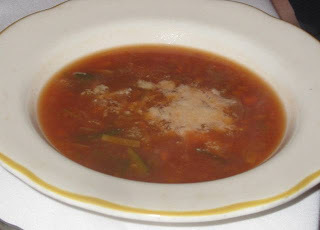 A very hearty Vegetable Soup sprinkled with Parmesan. 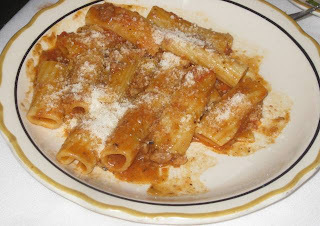 Pasta with Meat sauce. Getting full yet? 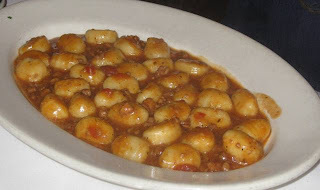 Gnocchi, the Italian dumpling bathed in their house meat sauce. 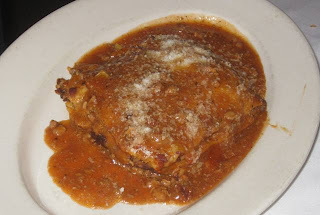 Bobby's order Baked Lasagna - hard to tell that it was Lasagna from the photo. 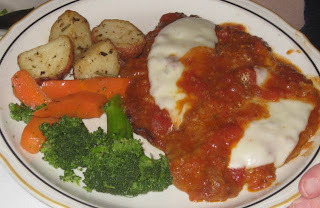 Veal Parmesan - Mike's order. He was happy with his order. Doesn't it look great? Now it is my turn for what I ate! Finally! I ordered what was written on the Special's Board. The Crab Cioppino. Apparently it was not supposed to be on the Board and it was not on the menu for the evening. However, they pulled through and made it for me anyway! How nice of them. It was a full bowl of a whole Crab, Mussels, Clams, Prawns and Calamari all bathed in a tomato based broth. Tasted fantastic! The best cioppino I have ever in my life. Hands down! 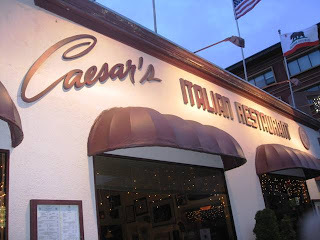 The sixth and seventh courses were coffee and Spumoni. 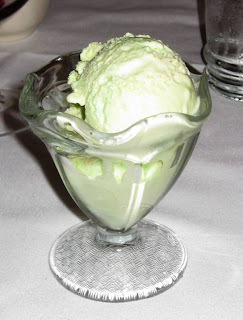 The Spumoni tasted a lot like Pistachio Ice Cream. Still very delicious. All in all, this restaurant was such a treat. The staff was just wonderful. 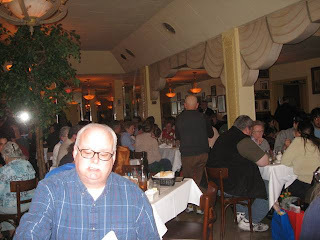 The dining room was completely full when we arrived at 7:15. Our water glasses never were empty and their were people clearing plates consistently. The menu was large and included none Italian food as well for the non noodle lover. 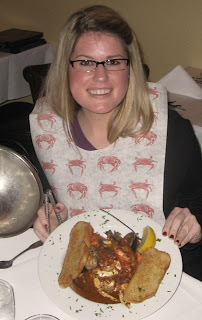 My Crab Cioppino was fabulous. 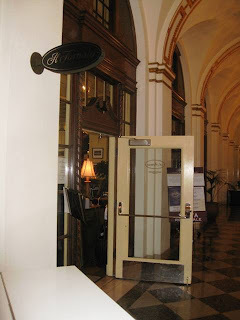 The Valet parking also was a nice addition, as parking can be such a chore in San Fran. Would I return? Yes! Thank you Goode family for the opportunity to try out this neat, little landmark! 1.75 thumbs up! I made the Free Lance!